We need networking where we can run muti computer setups with separate cameras. ED! THIS ONE IS EASY: A Supported MFCD/Image Export API!! let's hope Zarthrag will sort the bugs out. his approach seems to be legit at least for the not so refresh sensitive view-ports. Last edited by PeterP; 06-18-2012 at 09:23 PM. The only other thing with rendering three screens is that it does not play well with trackir. When looking forwards it's OK but when you look around horizons never meet up. That's because this kind of render is made for a static view. It is physical impossible to ad something like Track-ir on-top on your "natural view"
- now try to imagine to use a TrackIR in this pit ...?! seems kind of useless - don't you think so too?! Last edited by PeterP; 06-18-2012 at 11:01 PM. Something like iracing has the three renders but still lets you use track ir properly, for those without 270 degrees and a 4th screen for the top view it's still a really nice feature to have and can obviously be done. The reason why it works in Iracing (and every car-racing) so good is because your view is "always" in level to your relative heading - so the horizon will not get bended in zig-zag. --You will look in a car racing always to your steerpoint to be "on track" - you don't do it in a flight-sim - so you don't notice this so much. But the render is almost the same. These are things that you only experience in DCS while taxiing and while your take-off run. The overall render method is not the problem - its our limited FOV (when looking on monitor('s) ) to simulate the real-world, that is causing the trouble. - simply because it's physical not possible to simulate a normal FOV on a small window that covers only a small portion of your natural FOV. So there is simply no reason to be sorry about to try something that is impossible - it's always a compromise for us desktop jockeys. Last edited by PeterP; 06-26-2012 at 09:17 AM. --You will look min a car racing always to your steerpoint to be "on track" - you don't do it in a flight-sim - so you don't notice this so much. But the render is almost the same. I am not sure I can agree with you here. You are making it sound as if it cannot be done and the only reason it works in something like iracing is because of your heading. iRacing takes a number of factors for it's screen setup. The width, height, angle of side monitors and eye distance to the screens. All this information must be entered and when done correctly the results are excellent. I think this is enough information to render three screens properly with a trackir enabled configuration and from what I have seen I believe it is more than just a coincidence that it only works because of where the nose is pointing. A lot of tracks and various up's and downs and down corkscrews that should show up these issues as dcs does if there is no technical way to avoid it. You are right - iRacing let's you adjust much more settings for each view-ports as we can do in DCS. - so it's much more natural and you can set it up exactly to your monitor-setup. DCS options in the View-port setting isn't capable to set a specific FOV for each view port / it's only DX /DY - and when you change the FOV - it's all view ports or nothing..! So I hope you get my point . To get the same results like in iRacing - we have to use only one FOV that reflects only our real FOV that our monitors covers in the Real-world in DCS . Again: I agree that iRaching has much more options for customisations - but it is also only a compromise. - and is only working for your monitor-setup at a specific FOV to look natural. Yes, I understand that its possible with iracing because of the extra options to cater for it. 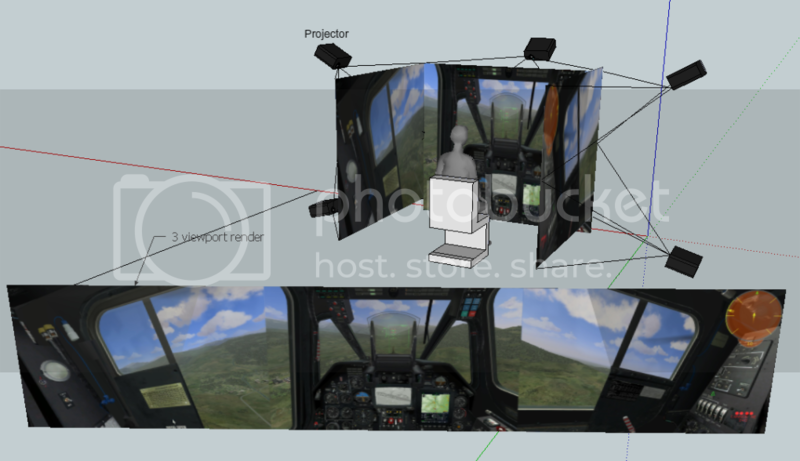 I was just pointing, trying to be on topic, that TIR will screw things up in DCS with three screen rendering. For some people this might be a surprise if they are used to it working better in other games. But - in iracing you can change the FOV to one that might not be realistic but it will still maintain the correct angles on the screens given the other screen information you entered on setup. Things that I "try" to explain the last three years on this forum. -- English (US) -- Russian (RU) All times are GMT. The time now is 12:39 PM. vBulletin Skin by ForumMonkeys. Powered by vBulletin®.